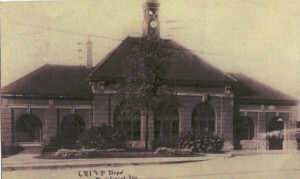 The company’s attitude must have changed, however, for in 1901, Charles S. Frost of the Chicago architectural firm of Frost and Granger was retained to design a new depot in Rock Island. The firm specialized in depots for several railroad companies, with over 200 built throughout the Midwest. Contractor John Volk built the magnificent $75,000 Renaissance Revival building and its nearby freight house. Another Real Photo postcard from Shannon Hall shows its appearance circa 1920. It was 35 feet long and 40 feet wide. On the west wing of the building (left on our postcard) were the smoking room and men’s toilet while a “retiring room” and women’s rest room were on the east, along with the main entrance. The tile roof supported a clock tower that reached 80 feet high. The soaring 30-foot ceiling of the main waiting room was embellished with decorative plaster. The postcard shows the beautifully detailed brick work, the massive brackets, and the huge round-topped openings with decorative mullions dividing the large window panes . Recessed courses of brick create a horizontal stone-like texture above the rough granite foundation. Especially noteworthy is the construction of the arches. In contrast to arches formed using tapering widths of mortar between rectangular bricks, the bricks in the depot arches are actually individually shaped in a carefully calculated taper, producing a beautiful arch with narrow mortar lines. The Rock Island Line had its roots at a meeting in 1845 when plans were developed for a railroad between LaSalle and Rock Island. Henry Farnam, who was employed to research and construct the route, determined that the route would be impractical unless it extended all the way to Chicago. In late 1852, construction began at the Chicago end and six months later the first “Rocket” train arrived in Joliet. Less than two years later, on February 22, 1854, two trains entered Rock Island from Chicago for the first time and eleven carloads of passengers disembarked at the tiny wooden depot located on Second Avenue and 20th Street. Although Rock Island was little more than a village of five thousand, crowds gathered in celebration. Dignitaries and railroad officials were honored as the festivities continued into the night. It was a big day for Rock Island, a day that assured her future as a transportation center. But the passenger facilities here didn’t change much, even as the Rock Island Line expanded across the river and to the west. Freight was simply more important than passengers. 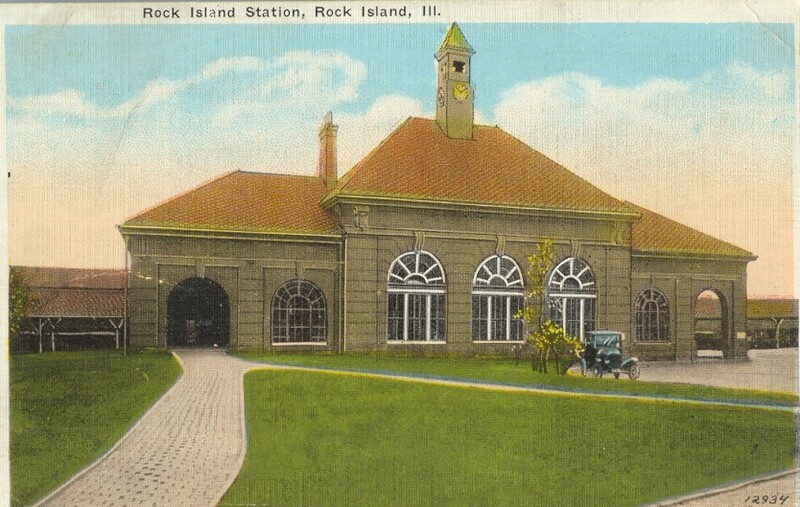 Although other railroad lines would maintain grand passenger stations downtown, the Rock Island Lines didn’t offer passengers high style even after a newer depot was built on 5th Avenue. That is, not until our postcard depot opened in 1901. In 1952, the company commemorated the centennial of the first Rock Island railroad journey between Chicago and Joliet by installing a memorial at the depot. The building itself was renovated, although the clock tower had been removed much earlier. The center south window was removed and replaced with entry doors, complete with a turquoise colored metal canopy. The men’s restroom was moved to the east wing, and a kitchen and lunchroom were added in the west wing. Dropped tile covered the beautiful ceiling and light fixtures in the main waiting room. In later years, the red tile roof would be covered with black tar in an attempt to stop leaks. The last passenger train left here on May 31, 1978, however freight trains continued to run for two more years. Iowa Interstate Railroad took over the railroad yards and buildings but did not use the depot. The building was listed on the National Register of Historic Places in 1982 and was designated a local landmark in 1987. During the 1980s, private attempts to rejuvenate it were unsuccessful, including the Greater QC Railway Historical Society, which took steps to open a railroad museum in1986. By 1989, the Development Association of Rock Island had high hopes for the building as well. Finally, the city purchased the old depot in 1994 for $8400 from Iowa Interstate RR. Federal historic preservation dollars from the Intermodal Surface Transportation Efficiency Act (ISTEA) plus a significant contribution from the city allowed exterior restoration to begin. The Rock Island architectural firm Gere-Dismer developed the challenging restoration design following strict guidelines from the Illinois Historic Preservation Agency. The freight house – which was in very poor condition — was sacrificed for its materials, including brick, wood trim, and roof tiles. Additional roof tiles were found from the same source quarry in Ohio. They are made by Ludowici in the Conosera style. 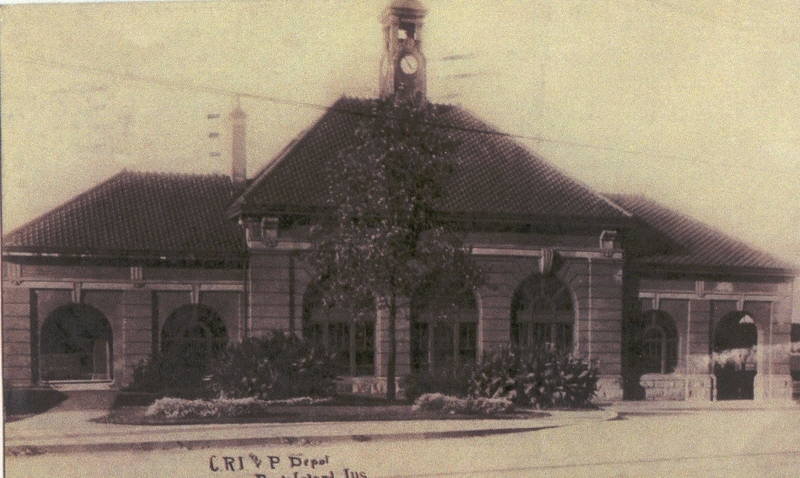 The depot’s main entrance was returned to its original location in the east wing. Windows were restored. Deteriorated and missing stone was replaced with stone from the original quarry in Ohio. The tile roof was completely removed, cleaned of tar, and replaced. The “high” point of the restoration occurred on October 16, 1996, when the replicated 16-foot clock tower, which had been removed 50 years earlier, was carefully lowered into place with a crane. But the interior remained undone until 1999 when the Lemon family, who had already restored Bettendorf’s Abbey Hotel, stepped in. Once again Gere-Dismer was retained to restore the interior and adapt it to function as today’s magnificent reception and meeting facility that seats 270. Bathrooms, a kitchen, and a bar were incorporated into additions that are barely visible from the exterior. To illustrate the creative design, the originally open arch at the far left of our picture was enclosed with dark tinted glass. This allowed significant interior space with minimal impact on the historic appearance because the dark glass is nearly invisible. The restored Rock Island depot is a success story in every way. This article, by Diane Oestreich, is slightly modified from the original that appeared in the Rock Island Argus and Moline Dispatch on February 2, 2004.